Hi all, I am currently blogging from Taiwan. One of the fun things I love to do here is shopping at 7-Eleven. You might wonder what's the big deal about 7-Eleven. The convenience store culture in East Asia is different than what you'd find in the US. The 7-Eleven stores here in Taiwan are marketed in a different way than the ones in the US. Thus, it has a totally different vibe in Asia than in the US. Orginally, 7-Eleven was established in the US in 1927. Now, it has become the major convenience store chain in many Asian markets. 7-Eleven stores open 24 hours a day, 7 days a week. If you know the history of 7-Eleven, these stores used to open from 7 a.m. to 11 p.m, thus the name 7-Eleven. However, they revolutionized the concept of convenience store by establishing 24-hour stores. 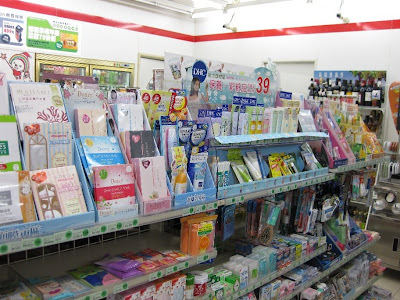 In Taiwan, the 7-Eleven stores provide services from foods and drinks to newspaper/magazines, office supplies, skincare/makeup products, photocopying/fax services, bill paying services, and delivery/pick-up services. I always like to pick up ready-to-eat food (something like TV dinner) like bento box or Japanese maki rolls for lunch while I shop for beauty magazines in the store. 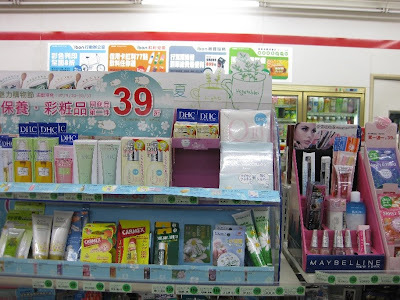 The pictures shown are images of the beauty section in a random 7-eleven store in Taipei, Taiwan where you can find DHC, Maybelline, Burt's Bee, Mentholatum, Herbacin...etc. The stores are usually very tidy and clean, and the customer service is friendly. Given the limited store size, the beauty products do not come in a wide selection in terms of brand and color variety. And, as usual, the prices might be higher than what you can find at drugstores or retail chain stores. But all in all, the beauty merchandise is carefully selected to best suits the demands and tastes of local shoppers in a reasonable price range. Do you also like to shop at convenience stores? Is there anything special about your local convenience stores? This is so neat! Our 7 elevens in New Jersey in the USA are crumy! They are dirty and do not carry anything fun! I just love your blog! I hope you can check mine out sometime! The 7-Eleven stores in Taiwan are really neat. People here seem to have a heavy reliance on 7-Eleven for newspaper(s), drinks and on-the-go food. They might not have a great selection of beauty products and accessories here. But, for me, I really enjoy browsing the beauty section to find goodies like hand cream or lip balm, and the magazine section for fashion and beauty magazines. Oh yes! I grew up in Taipei, Taiwan but have moved away from the country for many years. I almost forgot the 7-11s till your post! I imagine they must have made vast improvements (because if memory serves, 7-11s were mostly food and magazines back when I lived in Taipei). What beauty finds did you spot?